Due to the publicity from television coverage of the Cash-Landrum story (on That’s Incredible! ), Oregon Representative Ron Wyden launched an inquiry as to whether U.S. helicopters were involved in the incident. Initially the investigation was conducted by Captain Virginia (Ginny) Lampley of the Air Force. Within a short time, it was clear that the helicopters described in the incident were not Air Force, but matched Army equipment. The Army was given the investigation and the Department of the Army's Inspector General’s office assigned the task to Lt. Col. George C. Sarran. In his investigation, Sarran checked with all bases within range operating helicopters. The incident was said to involve 23 helicopters, but Sarran accounted for emotional exaggeration and was looking for far fewer. 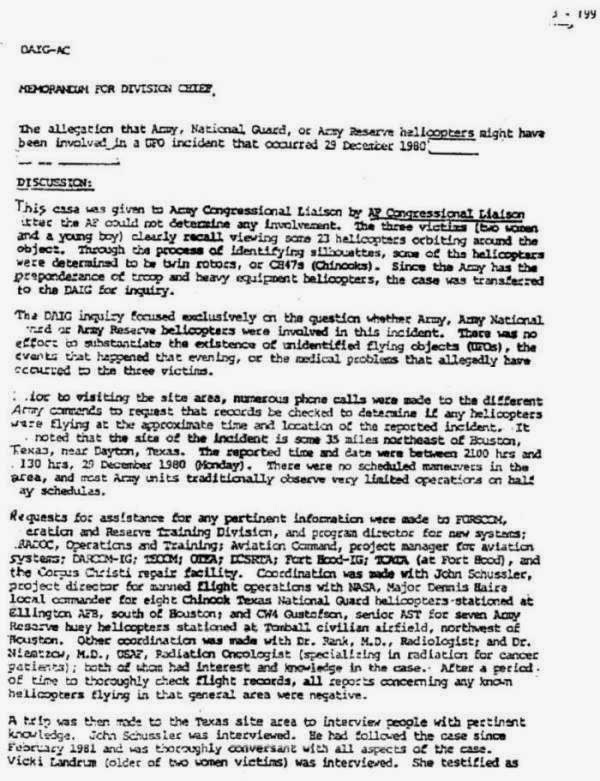 His specific mission was to find if military helicopters were involved, He was not sanctioned to investigate the UFO incident itself, but he felt he must give it some consideration in order to understand what happened and find the source of the helicopters. Dr. Peter Rank (Radiologist, medical consultant to MUFON, FUFOR). Dr. Richard C. Niemtzow (Radiation Oncologist, kicked out of VISIT when he joined the Air Force, as they felt he could not be trusted. MUFON medical consultant). John F. Schuessler (codename Snowbird). Captain Paul Tyler, M.D. USN. L.L. 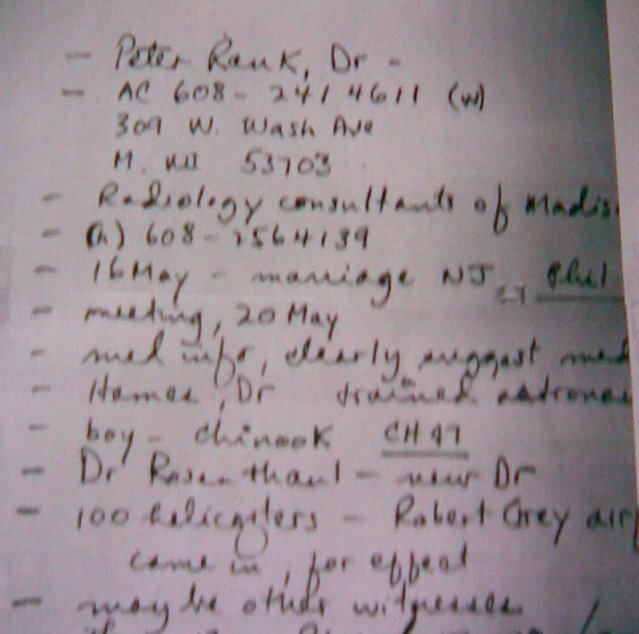 Walker and his wife Marie (helicopter witnesses. Another alleged helicopter witness refused to be interviewed, a petrochemical executive from Crosby. Sarran also visited the local military facilities, but found no trace of their involvement in the incident. 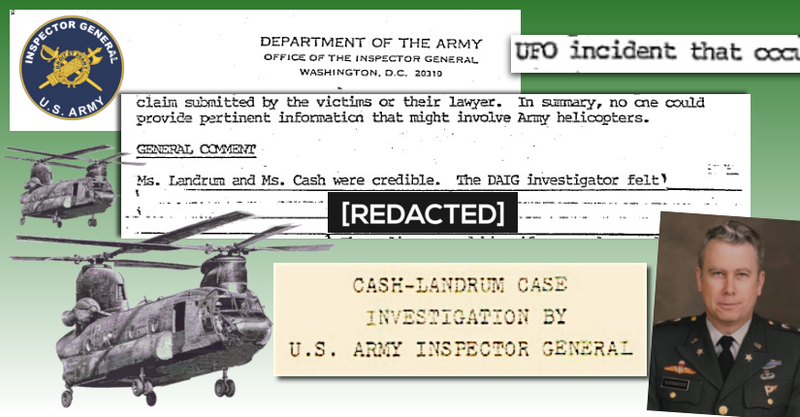 Sarran reported negative involvement of U.S. helicopters, but reported that the witnesses were credible. Parts of four lines were redacted when the report was released via a FOIA request. This was the only (known) official investigation into the incident. JS: I understand that, in addition to all the unusual things you did while at INSCOM, you looked in on a famous UFO incident – the Cash Landrum case . There were three of us that really got involved. A Navy captain, Paul Tyler, who was an MD, and a guy by the name of Richard Niemtzow, an Air Force MD. And George just had us come in, look at the material and talk to the witnesses. He had done a really thorough job. But all we came up with was, WTF? We had no idea what this was. And what eventually happened was that the lawsuit was dismissed, because there didn’t appear to be a causal relationship between the US government and the incident. Which is probably true, though the case really was a major mystery. I emailed Dr. John B. Alexander about a few things related to the case and his participation. 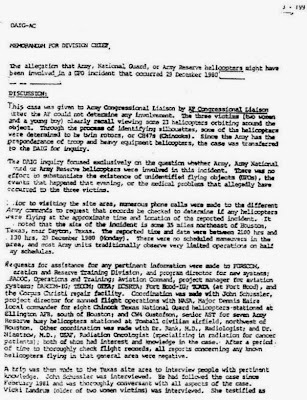 Q: Looking back at the report and memos, I see that only the radiologists Dr.s Rank and Niemtzow were named, (you) and Captain Tyler were not mentioned. JA: To begin with I'm reaching back over 30 years so I'm sure some details have slipped but I wrote about what I did remember in UFOs: Myths, Conspiracies, and Realities. I do remember the meeting with George that included MDs Niemtzow and Tyler. I know there were only four of us including George and I don't recall Rank at all. I would categorize the meeting as informal and part of Sarran's efforts to try and come to grips with a situation that did not make sense. As a side issue, yesterday I got an email from (Billy) Cox that stated this was Sarran's first investigation and therefore he might have been inexperienced. That is total nonsense. While I had left DAIG for INSCOM, I had worked with George on other investigations long before this one. It also stated that security clearances were a problem. They were not. Q: Do you remember (or have an educated guess as to) what was said in the four redacted lines in the Sarran DAIG report? JA: I could only guess at what he wrote. Remember I was only informally asked about the information, not integrally involved in the details or privy to them. I do remember being impressed with the amount of work that George had done. Most of the IGs I knew would have farted this off rather quickly. He didn't, probably because of the impending lawsuit. It was surprising to me that he had even investigate helicopters from other services as well as what the oil industry might have put together. That was well beyond what he would be required to do in his charter, but does speak to the thoroughness of his investigation. Best guess is that it mentions a person, possibly a civilian, that was not known to others at the time the report was released. I do note his following statement about the witnesses being "cooperative and helpful." Note it is unusual that the report was released at all. At that time all IG reports were exempt from FOIA. Q: What about? The precursors to the Night Stalkers, Special Forces Task Force 158 (later 160) and their secret training for a second rescue attempt of the American hostages in Iran? JA: As for TF 160, they were known to us, and George specifically checked them out. They were eliminated quite quickly. Besides, any such preparation would not have been conducted close to a major metropolitan area. 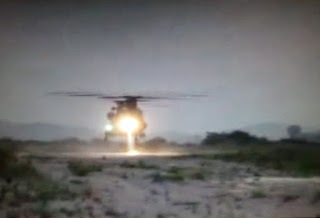 If your supposition was true about a second rescue, that would have been done at the infamous Area 51 where the conditions area about the same as in Iran. Would like to hear what you come up with as well. As far as I know, we had nothing that would produce the kind of radiation illness that followed. My view was that given speed of onset and severity of symptoms, they should have been at LD 100 (at least the two women) from any radiation source that we had. Q: (After sending Dr. Alexander declassified DoD documents about TF 158/160 1980 exercises) Could the incident have been a military exercise accidentally exposing the witnesses to a chemical agent? JA: While I was on the periphery of this, I do remember George saying he had checked with TF 160 and eliminated them. You have obviously done a lot of research and I'd love to see more of the material from TF 160 if you have it. The closest area mentioned is Lubbock, and that is a hell of a long way from Houston and no indication they were there in late December. Maybe other documents are more precise. In addition, while hooks were specifically indicated, there were other types of helicopters spotted. According to what you provided, the birds were split up for training purposes and only the Little Birds mentioned as being anywhere close (if you consider MS close to Houston), and for a two week period at that. I don't understand the part about Schuessler providing the medical records. I thought they came from direct sources as a result of the official investigation (not the IG one). 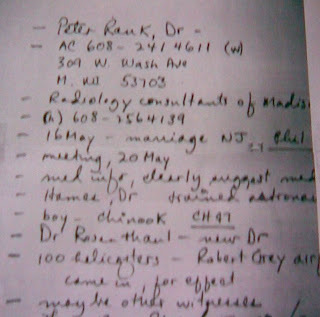 I'm still in contact with Paul and another doctor (not previously mentioned) who I believe both saw the medical records. As for the other hypothesis (TF-160 & chemicals etc) that seems even more complex and unlikely that the original UFO one. Would love to see any supporting data. Or tell me where it is located. Appreciate your interest. I too would like to find an answer to this case. As stated in my book, I am 100 percent sure it happened. However, it defies explanation and the simple "experimental aircraft gone bad" does not fit for all the reasons I listed. How George Sarran’s notes were twisted into a cover-up conspiracy theory.